Soil horizon: Horizontal layers of soil which are distinct from one another. These develop over time due to many factors including the addition of decaying plant material, chemical weathering of rock particles in the soil, and deposition of different kinds of rock materials. In my recent presentation at Icarus Interstellar Starship Congress 2015, “What kind of civilizations build starships?” I recurred on several occasions to archaeology in the course of my exposition. More and more I have been drawing on concepts from archaeology, as it is in archaeology that we find an extant science that has come close to formulating a science of civilization. There are, at least, explicitly formulated theories of civilization in archaeology, which go much further than the unsystematic observations of historians about civilization. In my talk I drew on archaeological definitions of civilization. Today I want to draw on another archaeological concept, the concept of an archaeological horizon, which is a concept employed pervasively throughout archaeology (as in “dark earth horizon,” for example), and, more specifically, I want to exapt the concept of an archaeological horizon for an exposition of the development of spacefaring civilization. Barbara Ann Kipfer, Ph.D., Encyclopedic Dictionary of Archaeology, Springer, 2000. David W. Anthony, The Horse, the Wheel, and Language: How Bronze-Age Riders from the Eurasian Steppes Shaped the Modern World, Princeton University Press, 2007, p. 131.
civilization: Complex sociopolitical form defined by the institution of the state and the existence of a distinctive great tradition. Barbara Ann Kipfer, Ph.D., Encyclopedic Dictionary of Archaeology, Springer, 2000, p. 119. When I was preparing my talk on civilization I was searching for explicit definitions of civilizations, and this is one that I considered but didn’t use as it was not quite right for my purposes. But informed by Deetz’s spatiotemporal definition of a tradition, one might get close to a quantitative conception of civilization with the “great tradition” defined in spatiotemporal terms. An archaeological horizon could be formulated in terms of the presence of a class of artifacts, or in terms of the absence of a class of artifacts “An archaeological horizon can be understood as a break in contexts formed in the Harris matrix, which denotes a change in epoch on a given site by delineation in time of finds found within contexts.” (Wikipedia) In other words, a horizon can be formulated as the beginning or the end of some class of artifacts. One might, then, define a horizon in the most general terms possible as a particular structure of material artifacts in time. While archaeologists work with artifacts of the past, often long out of use (perhaps so long out of use that their function is difficult to identify), there is no reason we cannot extrapolate horizons to artifacts in contemporary use, or even not yet in use. With spacefaring civilization to date we are working with very little information, so much of the horizon structure of spacefaring civilization is conjectural. If, instead, we sought to explicate the horizon structure of scientific civilization, which has been in existence much longer than spacefaring civilization (which has not even yet fully attained its first horizon), there is much more empirical data at our command. The horizons of scientific civilization are marked by artifacts — scientific instruments — but more especially by epistemic horizons. When sciences or bodies of scientific knowledge became commonplace, we have an epistemic horizon. When Newton brought to maturity the astronomical, cosmological, and physics developments of the century or more preceding his work, an epistemic horizon we call The Enlightenment was the result. Such examples could be multiplied. Our moonshots and even our multiple probes to other planets in our solar system were outliers. They do not define a horizon of space exploration. It is arguable that now, today, with inexpensive CubeSats becoming commonplace, that we are reaching a horizon for satellite technology. This is primarily a function of cost. A CubeSat is now within reach of even small budgets. When human spaceflight eventually reaches a cost at which space travel can be inexpensive and routine, then we may achieve a human spaceflight horizon, initially to low Earth orbit (LEO). Further horizons will follow as technology improve and costs diminish. Stage II spacefaring civilizations might be defined as those that have established a permanent, self-sustaining presence off the surface of the world of a given civilization’s biological origin. This could also be defined in terms of practical, durable, and routine inter-planetary travel. This is the minimal level of civilization to assure long-term survivability. Stage III spacefaring civilizations would have achieved practical, durable, and routine interstellar travel. Stage IV spacefaring civilizations would be defined in terms of practical, durable, and routine inter-galactic travel. Stage V spacefaring civilizations would be defined in terms of practical, durable, and routine travel in the multiverse, i.e., beyond the known universe defined by the consequences of the big bang. While I formulated these stages of spacefaring civilizations in terms of practical, durable, and routine space travel, I see now that the way to approach these would be to identify each as a horizon of spacefaring civilization. As noted above in relation to (relatively) cheap CubeSats, a spacefaring horizon may be achieved for automated probes before it is achieved for human beings; we are on the cusp of a satellite spacefaring horizon, when our artifacts achieve wide spatial distribution over a relatively short period of time. If this satellite spacefaring horizon is followed by a human LEO spacefaring horizon (Stage II above), cheap access to Earth orbit for human beings will open the possibility of the next wave, which would presumably be a planetary probe spacefaring horizon, followed by a human planetary spacefaring horizon (Stage III above). The expansion of terrestrial civilization into extraterrestrial space, then, may follow a pattern of an automated spacefaring horizon followed by a human spacefaring horizon. I think it would also be useful to distinguish between initial horizons (when an artifact appears) and terminal horizons, when an artifact disappears. Perhaps archaeologists already do this, although I didn’t find any mention of such a distinction in any of the books I’ve recently skimmed, looking for discussions of horizons. Just as the emergence of a civilization would be attended by a sequence of initial horizons, the extinction of a civilization would be attended by a sequence of terminal horizons. The extinction of a spacefaring civilization would involve the reverse sequence of terminal horizons (counting back from Stage V to Stage 0) as the spatial scope of a civilization diminished from spanning the multiverse to being represented only on a planet (not necessarily the planet on which such a civilization originated), or possibly several planets. This, in turn, suggests the interesting possibility of a multiplanetary civilization returned again to the severe limitations of planetary constraints, technically still a multiplanetary species, perhaps distributed across several star systems, but no longer an interstellar civilization in so far as they no longer interact over interstellar distances. This suggests a further distinction to be made between the interstellar presence of a species and the interstellar interaction of a species. 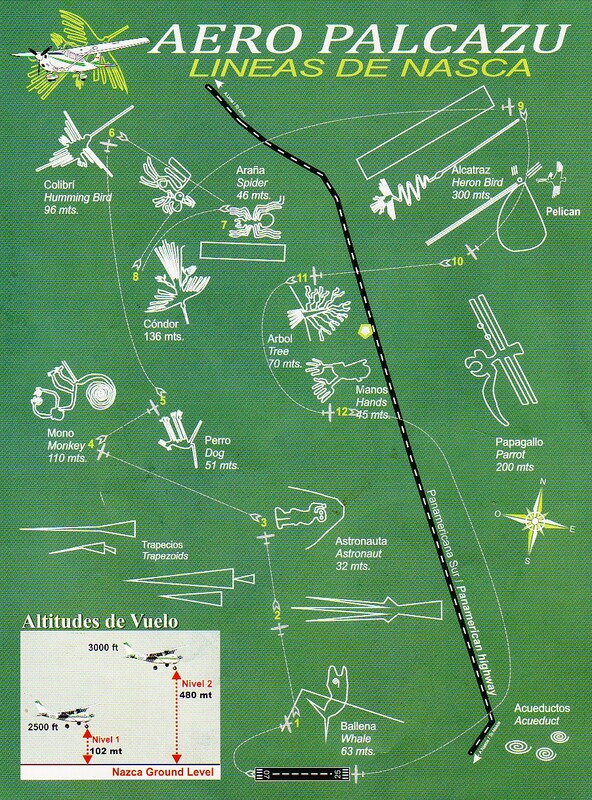 A short distance north of Nazca, along the Panamericana, and situated between the designs of the “hands” (“manos“) and the “tree” (“arbol“), there is a tower (the “Torre Mirador”) that can be climbed, probably about 40 or 50 feet in height, in order to view some part of the lines of Nazca without flying over them. This close-up view of the lines clearly reveals the construction methods that I quoted yesterday (in Lines in the Desert) from Mason’s The Ancient Civilizations of Peru — stones have been removed from within geometrically defined areas and the removed stones have been piled at the edges of the designs. The piled stones not only represent the space cleared, but the piles themselves serve to make the demarcation between cleared and non-cleared areas all the more obvious, making the distinction more visually striking. 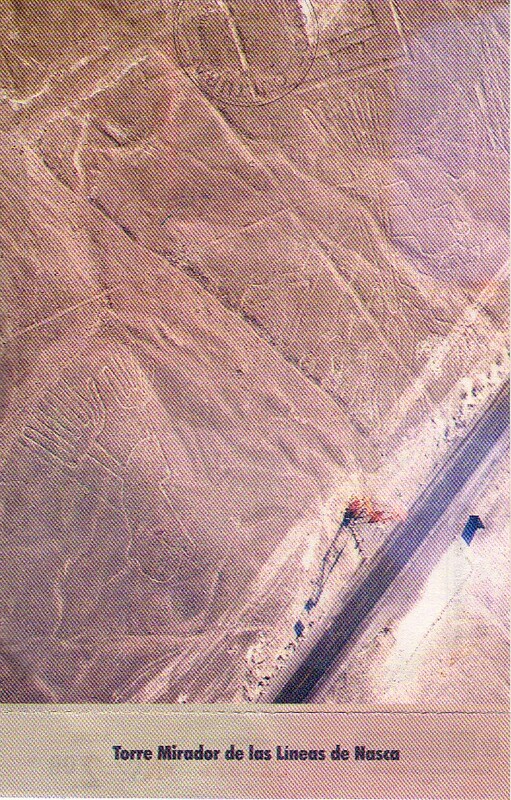 This construction technique was also used at nearby Palpa, and continues to be effective in the present day, as driving along the Panamericana (once outside the archaeologically preserved area) one sees a variety of messages spelled out in the desert, from the initials and names of individuals to fairly elaborate advertisements for small roadside stores. 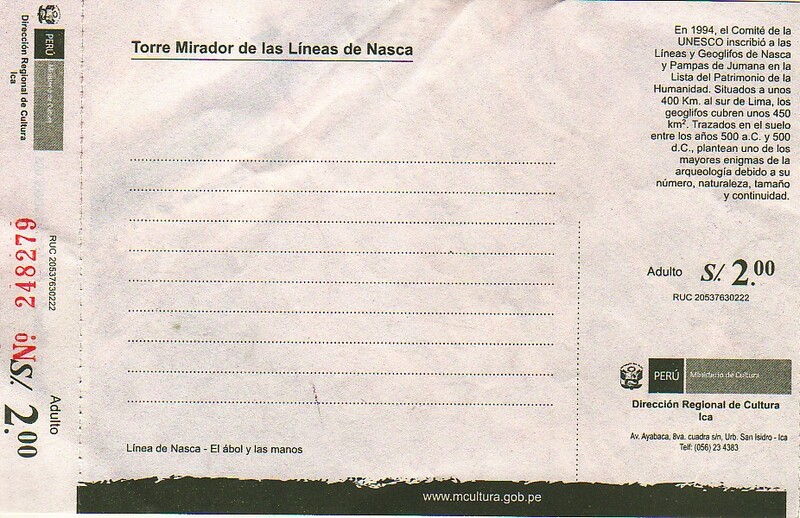 In my naïveté I though that any intrepid visitor of sufficient curiosity might walk out into the desert and and look at the construction of the lines for themselves, but the desert has been fenced off along the Panamericana to prevent further damage to the lines, and once made aware of the threat it becomes immediately obvious how damaged many of the lines and figures are, which accounts for some of the difficulty in seeing some of the patterns from the air. Some — but not all. Much is revealed by a close inspection (as one can gain from the tower along the Panamericana) that is lost in a distant view from the air, just as much is revealed in a distant inspection from the air that is close in the close-up view from near the ground. This is a perfect concrete illustration of what I was recently writing about in relation to the distinction between constructive and non-constructive thought (in P or not-P). In this post (on my other blog) I employed an image taken from Alain Connes to illustrate the constructive/non-constructive distinction such that the constructive perspective is like that of a mountain climber while the non-constructive perspective is like that of a visitor who flies over the summit of a mountain laboriously climbed by the other. Any thorough investigation will want to make use of both perspectives in order to obtain the most comprehensive perspective possible — even though each perspective has its blind spots and its shadows that compromise our perspective on the whole. Indeed, it is precisely because each perspective incorporates deficits specific to the perspective that one will want to supplement any one perspective without another perspective with a different set of specific deficits. Between two or more fundamentally different perspectives on any one state-of-affairs there is the possibility of constructing the comprehensive conception that is excluded by any one perspective in isolation. 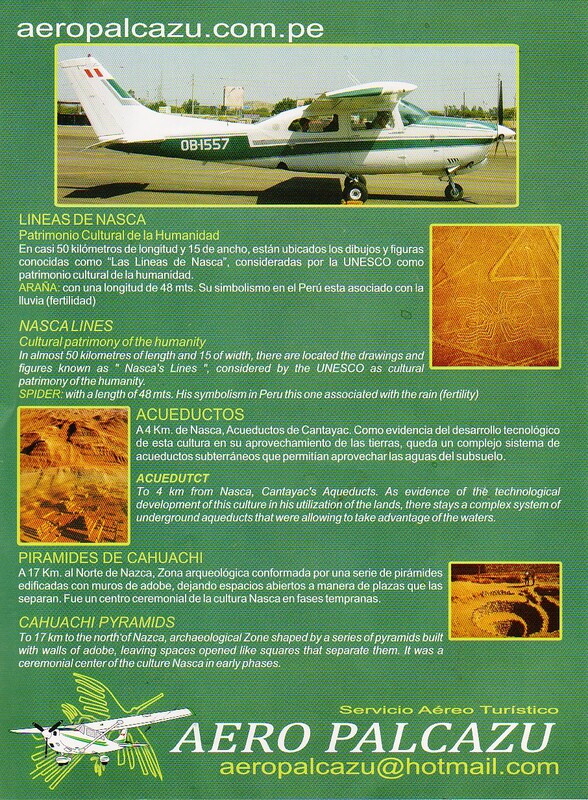 The two perspectives offered on the Nazca lines by the tower and an airplane flyover also reminded me of a point that I imperfectly attempted to make in my post on Epistemic Orders of Magnitude, in which I employed aerial photographs of cities in order to demonstrate the similar structures of cities transformed in the imagine of industrial-technological civilization. This similarity in structure may be masked by one’s experience of an urban area from the perspective of passing through the built environment on a human scale — i.e., simply walking through a city, which is how most people experience an urban area. Now, in light of what I have subsequently written about constructivism, I might say that our experience of a built environment is intrinsically constructive, except for that of the urban planner or urban designer, who must see (or attempt to see) things whole. However, the urban planner must also inform his or her work with the street-level “constructive” perspective or the planning made exclusively from a top-down perspective is likely to be a failure. Almost all of the most spectacular failures in urban design have come about from an attempt to impose, from the top down, a certain vision and a certain order which may be at odds with the organically emergent order that rises from the bottom up. This reflection gives us yet another perspective on utopianism, which I have many times tried to characterize in my attempts to show the near (not absolute) historical inevitability of utopian schemes transforming themselves upon their attempted implementation into dystopian nightmares — the utopian planner attempts to design from a purely non-constructive perspective without the benefit of a constructive perspective. This dooms the utopian plans to inevitable blindspots, shadows, and deficits. The oversights of a single perspective then, in the fullness of time, create the conditions for cascading catastrophic failure. Historically speaking, it is not difficult to see how this comes about. After the astonishing planned cities of early antiquity, many from prehistoric societies that have left us little record except for their admirably regular and disciplined town plans, Europeans turned to a piecemeal, organic approach to urbanism. Once this approach was rapidly outgrown when cities began their burgeoning growth with the advent of the Industrial Revolution, it was a natural response on the part of Haussman-esque planners to view organic urbanism as a “failure” that necessitated replacement by another model that envisioned the already-built environment as a tabula rasa to be re-built according to rational standards. Cities henceforth were to be wholly planned to address to inadequacies of the medieval pattern of non-planning, which could not cope with cities with populations that now numbered in the millions. I have observed elsewhere (in my Political Economy of Globalization) that many ancient prehistoric societies were essentially utopian constructions over which a god-king presided as a living god, present in the flesh among his people, and indeed some of the most striking examples of ancient town planning date from societies that exhibited (or seem to have exhibited) this now-vanished form of order. For only where a god-king is openly acknowledged as such can a social order based upon living and present divinity within the said social order be possible. Such egalitarian societies focused on the satisfaction of consumer demands were rare in the ancient world, but we should not be surprised that it was an egalitarian society, organized constructively from the bottom up, that produced the astonishing lines in the desert of the Nazca. 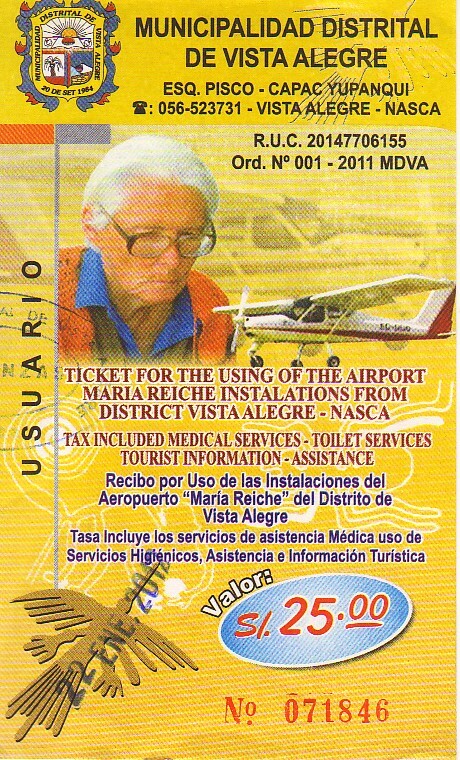 Without an aerial perspective, the making of these lines was a thoroughly constructivistic undertaking, not even counter-balanced by a non-constructive perspective, which has only been obtained long after the Nazca civilization has disappeared, leaving only traces of itself in the dessicated sands of the desert. While I am posting this a couple of days after the fact, this entire account was written in longhand on the day here described. Last fall in Experimental Archaeology I discussed the recreation of several sea voyages in the interest of determining what exactly is possible in terms of the capabilities of early seafaring technologies. Today my attention has been directed to another form of experimental archaeology in the form of the construction of a castle, Guédelon, in Yonne, Burgundy. On the BBC front page the story about the castle was called “France’s Folly” and even the website maintained by the castle builders calls the project an “idée folle” and further identifies it as “Michel Guyot’s crazy scheme” and a “hairbrain scheme.” There is, of course, nothing crazy about it. Ever since the first Skansen (open air museum) was founded in the late nineteenth century near Stockholm, Europeans have been attempting to preserve the rural heritage of Europe’s Agricultural Paradigm. 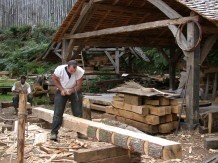 The open air museums of Europe range from the simple preservation of historical structures to elaborate reconstructions of rural and village life before the Industrial Revolution. And in Sweden, the point of origin of the Skansen movement, there is even an open air museum dedicated to the early stages of the Industrial Revolution, the Siljansfors Skogsmuseum, which has an early blast furnace and Bessemer works on display. I have especially enjoyed open air museums since my first trip to Europe in 1988 (when I visited a large open air museum outside Copenhagen), and have visited as many as I could locate in subsequent years. While open air museums usually focus on reconstructing life within actual buildings preserved from the past, it is an obvious next step to seek to recreate a building in furthering the mission of experimental archaeology. One learns much by attempting to live as our ancestors lived and in their structures. 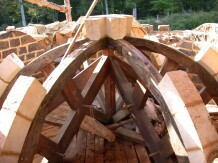 One also no doubt learns much from attempting to build from scratch the kind of structures that our ancestors would have built. 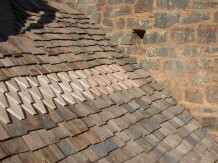 The construction of a small castle would have much to teach the experimental archaeologist, since it would involve not only the castle itself, but the crafts, skills, tools, and materials needed to build a 13th century building with 13th century tools and technology. Previously I wrote about reconstructing sea voyages, and today I have touched on the reconstruction of the built environment. It is interesting to note how schematically these two approaches to experimental archaeology divide between an activity that represents a mobile way of life (sea borne trade) and a structure that represents a settled way of life (subsistence agriculture). These two approaches to experimental archaeology (which are in no sense mutually exclusive) also constitute two approaches to life and to civilization: the mobile and the settled. These two attitudes also embody a distinction that I have made between social technologies and hardware technologies: choosing to move is a behavioral modification that is essentially a social technology, whereas choosing to settle means developing a settled civilization whose primary monument is its material culture, i.e., its hardware technologies. Obviously, and in the big picture, mobile and settled societies are inter-dependent. In the long term, the bulk of the human species may tend more to the one or to the other, but the mobile life and the settled life are both perennial aspects of the human conditions. The nomad and the settler re-appear time and again throughout history, each playing a role that is related to the other. A Russian icon of Saint Nicholas, Bishop of Myra, Defender of Orthodoxy, Wonderworker, Holy Hierarch. The 6th of December is the feast day of St. Nicholas and, as it happens, my name day after a fashion. I say “after a fashion” because anyone who has grown up and gone through life primarily known by their middle name knows the constant confusion that it can engender. I am told that my maternal grandfather began the tradition of referring to me as “Nick” when I was less than two years old. The name stuck, and it is what I continue to use today, though it is not my first given name. Thus the Feast of St. Nicholas is the name day for my second given name, but the name by which I primarily identify. So much for that. 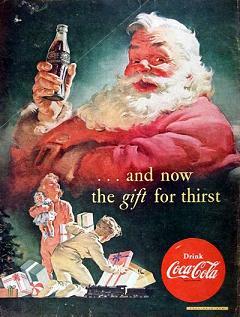 Saint Nicholas is primarily remembered in our industrialized world as the saint who was transmogrified by consumerism into Santa Claus, the patron saint of retailers and icon of classic Coca-Cola commercials. Before his transformation into a spokesman for getting and spending (thereby laying waste our powers), St. Nicholas was a popular saint of late antiquity beloved by generations of pious Christians for almost two thousand years. 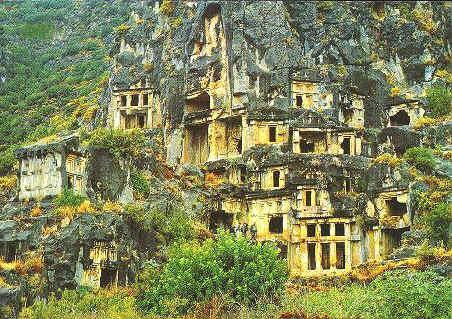 Ancient Myra is known for its rock cut tombs such as one sees along the Lycian shore. 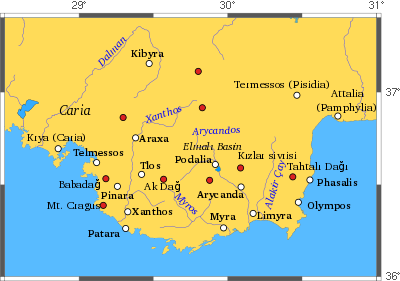 St. Nicholas was the Bishop of Myra, a town on the coast of what is now Turkey, though in Roman times the region was called Lycia. The saint’s original tomb was in Myra, and in fact can still be found there in the basilica. But the relics of St. Nicholas were stolen from the tomb in the basilica in 1087 by merchants from Bari (thus the commercial connection reveals itself early on), who took them to Bari (the technical term for moving the bones of saints is “translation of relics”), where they lie still. St. Nicholas was (among many other functions) the patron saint of the Varangian Guard (burly northerners who were the personal guard of the Byzantine emperor), so the Varangian Guard guarded his relics at Bari much as contemporary soldiers guard tombs of unknown soldiers. Note that, while the object of veneration changes, the social structure of the ritual remains constant across diverse civilizations. In regard to actual documentary historical records, it is often literally the case that we have only only one volume out of several, and sometimes only a page or a paragraph out of a volume, so that what Darwin wrote metaphorically about the fossil record applies literally to the written record. 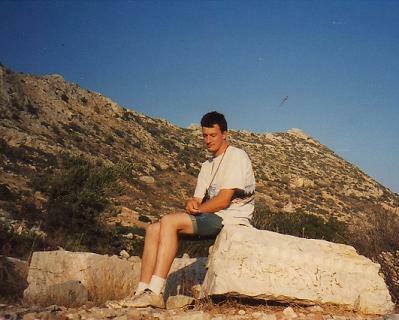 A photograph of me sitting on a broken piece of pediment at Knidos on the coast of Turkey, not far from Myra and Saint Nicholas Island. 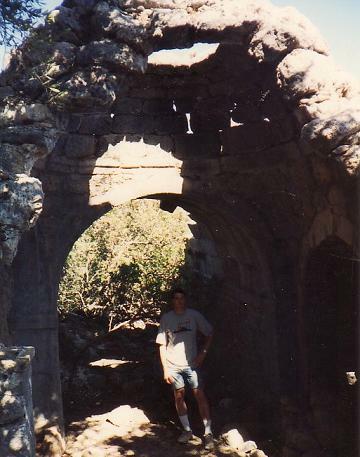 As it happens, I visited in the Lycian shore in 1993. I did not see Myra, though I was nearby. There is an organization called Earthwatch that organizes scientific expeditions supervised by professional investigators who are joined by volunteers who pay for the privilege of joining the expedition. Thus it was in the fall of 1993 I joined an Earthwatch expedition that cruised along the coast of what is now Turkey, documenting both the physical geography and some of the archaeological remnants. 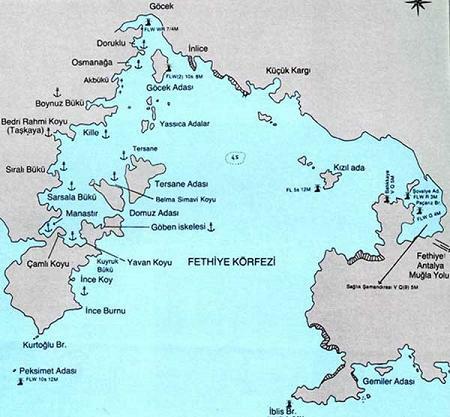 On the above map you can see Saint Nicholas Island in the lower right hand corner identified as 'Gemilier Adasi'. The principle investigator on this Earthwatch expedition was a fellow named David Price-Williams, who was a veteran researcher in the region and had extensive knowledge of Turkey from its earliest history to the present day. He brought the expedition to a small island close to the bay of Fetiyeh. The Island goes by two names: Gemilier and St. Nicholas Island. The small island is densely packed with Byzantine-era ruins, among which ruins there is a remarkable ceremonial passageway that extends all the way from the shore of the island up to near the top of the island where there is a ruined basilica that has been not merely built on top of the island but was once, at great effort, carved into the rocky substance of the island. The ceremonial passageway, now ruined, was at one time a covered walkway by which one could have walked all the way from a quay on the shore up to, and even into, the island’s basilica. It is obvious that much effort went into this construction, and one can still pick one’s way through much of the walkway, still covered in places. 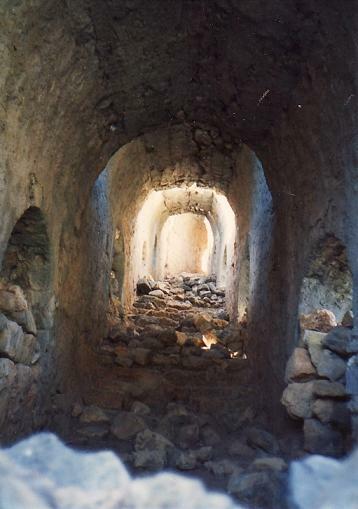 Inside the covered passageway on Gemiler, also known as Saint Nicholas Island. Since the covered passageway has been around for well over a thousand years, and its origins seem to have no documentation in the written record, it is inevitable that there should be many different stories about the structure, and this is what I find to be the case. A photograph of me inside the elaborate covered passageway on Gemiler. Many of the turns in the passageway are covered by small domes as in this photograph. David Price-Williams, the principle investigator of the Earthwatch expedition, had a theory about Gemiler Island. I don’t recall all the details, but so far as memory serves I believe he speculated that Saint Nicholas may have died at the particular location on the top of Gemiler Island, which accounts for the somewhat awkward position of the basilica and the effort that was made to excavate it into the rock of the island. As a location sacred to the memory of Saint Nicholas, the island became a place of pilgrimage in late antiquity. And, indeed, as I noted above, the island is thickly covered by ruins — the sort of development that could only be accounted for by money brought in from the outside as opposed to strictly local industry. The covered passageway, on this account, was a purpose-built structure for the translation of the relics of Saint Nicholas, which would have been a major event, perhaps celebrated annually and the occasion of much festivity. (My apologies to David Price-Williams if I have mis-remembered or mis-represented his views on this matter.) I find it a plausible account, and it is apparent from visiting the site that it was a place of some importance and population density before it was abandoned. 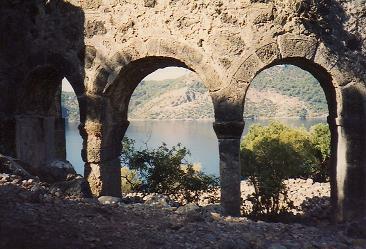 Some of the ruins lie below the water line, and we know from historical accounts that a number of catastrophic natural disasters afflicted the Byzantine empire in late antiquity. Turkey has a complex geomorphology, more or less occupying its own tectonic plate sandwiched between other neighboring plates. The result of this situation is that the relatively small Turkish-Aegean plate can twist and turn in catastrophic movements of the earth that suddenly plunge some areas of land several feet lower while raising other areas of land. Thus buildings constructed in historical times could find themselves under water as the result of one violent earthquake (not necessarily as a result of gradual subsidence, which would require much more time). 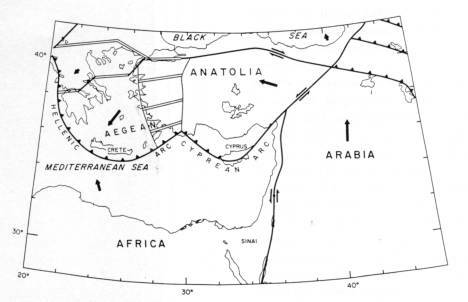 An illustration of the some of the tectonic forces operating on the Turkish-Aegean plate. Thus I have a certain personal connection to my namesake, perhaps having visited a spot that played a significant role in the growth of the cult of Saint Nicholas. Perhaps, but for the celebrations of Gemiler, Saint Nicholas might have been lost to history, and today we would have no Santa Claus. This is the merest of mere speculation — what philosophers call a counter-factual conditionals — but even a thought experiment, under controlled conditions, need not be irresponsible. It is certainly no more irresponsible than Collingwoodian a priori imagination by which we attempt to appreciate the what the ancient festivals on the island of Gemiler might have been like. And this is one of the things that most intrigues me about travel: the opportunity to inspire the historical imagination to get a feeling for life in the distant past. Without the original Saint Nicholas I am left with the amusing thought of subsequent namesakes, for example, Niccolò Machiavelli and Nikolaus Kopernikus. I would not hesitate to claim both as my namesakes. Both were intellectual revolutionaries. The one began the process of overturning medieval cosmology, and thus is responsible in no small part for the modern world as as know it today. 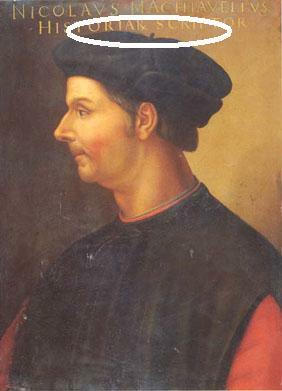 The other is similarly responsible in no small part for the modern world, though he began the process of overturning the medieval pieties that once dominated the practice of history. 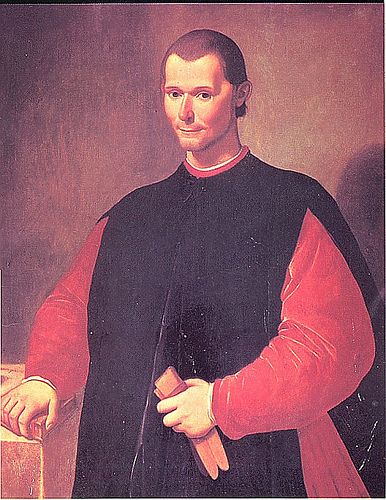 If Niccolò Machiavelli has not been canonized (not yet, at least), that is not my fault. I am in favor of the action. If, by unanimous popular acclaim, I were to be proclaimed Pope, I would certainly make it a priority. But the Papacy is not an office conferred by popular acclaim; one must, rather, have the acclaim of the College of Cardinals. Here I must admit the I have no pull whatsoever. Machiavelli ought to be a modern saint, or, we could say, he should enjoy the status of whatever is the secularized equivalent of sainthood. 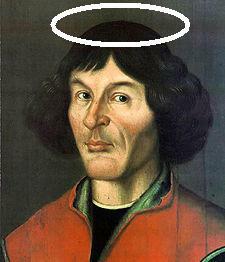 Similarly for Copernicus. Which brings us to an interesting approach to Löwith’s thesis (in his Meaning in History) that modernity isn’t a fully legitimate historical periodization since its categories are secularized derivatives of (mostly medieval) theological historical ideas. It would be an interesting thought experiment to accept Löwith’s thesis but not its valuation, and to extrapolate a thorough-going correspondence between properly theological concepts and their secularized equivalents in modernity. Is there a secularization of the idea of sainthood? But this is a task for another time. There is an interesting article on the BBC about the recreation of early ocean-going canoe voyages in the south Pacific, Yap revives ancient art of star sailing. I find this a fascinating example of experimental archaeology. Yap outrigger canoe in 1936. The BBC article referenced above focuses on the recovery of the cultural tradition represented by ocean-going outrigger canoes and celestial navigation for Yap island, but it could still be considered a form of experimental archaeology. As I said, experimental archaeology runs the gamut. There are serious studies and there are media stunts and there are the many European open-air museums (among my favorite places to visit). 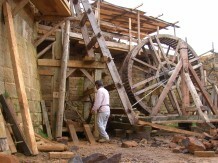 Open-air museums are sometimes maintained in part to reconstruct the life of the past and also in part as an entertainment for tourists. A few years ago when so-called “reality TV” was getting its start, public television jumped on the bandwagon and produced several series — some trivial, others riveting — that were essentially documentaries of experimental archaeology. I watched several of these with great interest. Perhaps the most famous example of experimental archaeology in our time is the work of Thor Heyerdahl in recreating ancient sea-going vessels and recreating long distance voyages with them in order to demonstrate the possibility of his archaeological theories that were rejected by the mainstream historical and archaeological community. The Thor Heyerdahl Kon-Tiki museum in Oslo is absolutely fascinating. I visited it more-or-less on a whim a few years ago in Norway, not expecting it to be all that interesting, but I ended up staying for several hours. I heartily recommend it. Voyages such as are made by the Yap islanders and those recreated by Thor Heyerdahl are crucial to our understanding of the last phase of human expansion and migration (which is not yet complete, but continues in an altered form even today). It is likely that the South Pacific was the last place on earth inhabited and settled by humanity. Perhaps if we had known the paradise that awaited us there, we might have gotten there sooner, but when men sail into the unknown they never know what they will find or whether they will ever return. And if they do not return, those who did not go do not know if they were lost or whether they found a better place and stayed there. The Pacific is an enormous ocean. It was not crossed by European vessels until Magellan’s expedition (though Magellan died before the circumnavigation was completed and did not live to see the Pacific crossing). To set out upon the Pacific in nothing more than a canoe, and to live to tell the tale, is a feat equal to any in the history of human achievement. Whether we should think of this as a moment in natural history or a moment in human or cultural history is not clear. I don’t know what to call it myself, since the settlement of the South Pacific by ocean going canoes, while it constituted the last stage of the globalization of the human species, still took place in prehistory. Ocean going canoes of the Polynesians that enabled the exploration and colonization of the South Pacific.